Read CEITR Blogs, Add your Comments, Add your Blog. Research Chair: Mansureh Kebritchi, Ph.D. and Associate Research Chair: Elizabeth Johnston, Ed.D. The Center will serve as the departmental home for faculty and students who have an expressed interest or research agenda associated with a variety of topics related to promoting quality of teaching and learning process by using technology-based tools, learning theories, or instructional strategies in K-12, higher education, and corporate settings within online or face-to-face formats; issues and challenges related to online teaching and learning; and global trends and issues in education. The Center for Educational and Instructional Technology Research is chaired by Mansureh Kebritchi, Ph.D. The Center is a place where students and faculty will find the collegiality and socialization necessary for an advanced community of learning. Research will be cultivated and supported in a variety of ways to include inviting direct affiliation with the Center and its research agenda, research contributions such as serving on advisory committee, or as one of the selected research fellows. Investigating global trends and issues in higher education. First, forms and supports network of researchers. Conducting research is a difficult lonely task. The center connects researchers with common research interests and supports them collaborate to complete their research. To achieve this vision Research Center adopted the following themes of Practice, Teach, Research, Reflect. 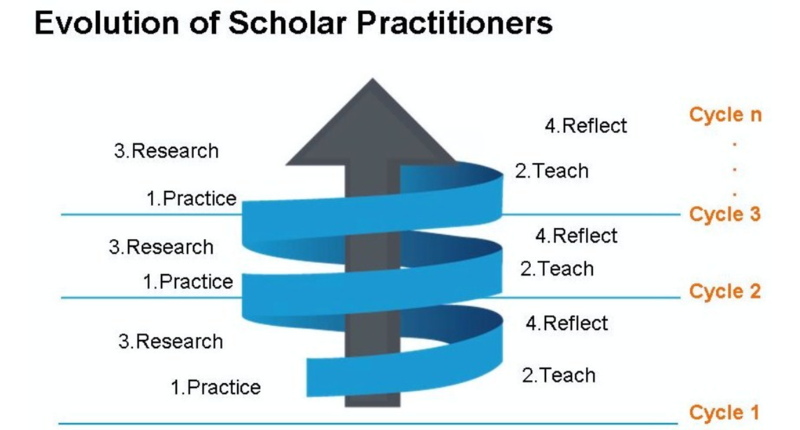 Evolution of scholar practitioners will take place by supporting researchers going through a spiral cycle of practice, teach, research, and reflect. In each cycle, the first stage is practice where center members apply their knowledge into their workplace, the second stage is using their knowledge and experiences from their practice to teach their students, after teaching, in the third stage, they would conduct a research related to problems, issues identified within their practice and/or teaching, the final stage is reflection where they reflect on what they learn from their research results. Their reflection will be used in their practice. Practice will be the first stage of the next cycle. The cycles may endlessly continue through which practitioners evolve into scholarly practitioners. • Supports the members to disseminate their research through presentation and publication. The plan is to have progressive annual publications. All members including fellows and research affiliates will complete their research, present, and publish their results within a 12 months time framework. • Enhances faculty and students’ skills to conduct research related to latest essential topics in the field of education and instructional technology.